I have just had the pleasure of writing and delivering a one-day training course entitled ‘Brief Advice for Health Behaviour Change’ that aimed to enable practitioners to deliver brief interventions using a motivational approach on the four issues of alcohol, smoking, diet and physical activity. The target audience was frontline staff, not just in healthcare (hospital staff and those delivering NHS Health Checks) but also prisons and workplaces. It is not the first time we have written training on IBA for topics other than alcohol (try IBA for alcohol and drugs for youth workers, or for alcohol and sexual risk-taking) but combining four topics into one process for IBA is not easy. Firstly, there are basic practical difficulties of how you build the knowledge and understanding of practitioners and address any prejudices or myths that may exist about not one but four issues, in a single day. This is by no means easy, but pre-course work helps. Even more tricky is how to describe and teach the process of ‘IBA’ for such a broad range of ‘lifestyle’ issues. Finally, the challenge is to design a process that can realistically be implemented in a 10 minute (max) conversation. While the basic IBA skills remain the same, we designed a completely new framework or IBA process in which to present and teach them. The course included discussion not only of how and when to raise the issue of ‘lifestyle’ generally, but also how to narrow the conversation down to one or two topics which the individual is ready to discuss. We discussed stages of change in terms of just three stages to simplify thinking and decision-making. And the ‘Identification’ or ‘Screening’ process inherent in IBA was simplified to exploring the individual’s current behaviour and comparing it to national guidelines rather than using a formal screening tool. The pilot went well, and I am confident that the challenges described can be met – but perhaps not for all of the people all of the time! And one key question remains – are some issues harder to raise than others? If you try to cover them all together, will practitioners avoid the issue they find most sensitive? And if so, which issue will be left out? In Scotland, I know that when Keep Well practitioners offering cardiovascular check ups (similar to NHS Health Checks in England) were trained on generic health behaviour change approaches, it was found that they avoided alcohol as an issue and separate training specifically on alcohol was provided. Was this a one-off? Or could we expect that diet and weight issues would be just as sensitive? We will soon be training 18 people to roll out the Brief Advice for Health Behaviour Change course to others via a two-day training for trainers course… watch this space! “advice to children under 15 years (2009) is to abstain from alcohol due to risks of harm, and 15-17 year olds are advised not to drink, but if they do drink it should be no more than 3-4 units and 2-3 units per week in males and females, respectively. In contrast, alcohol use is increasing in adolescents in the UK: the average amount consumed by 11-15 year olds doubled in the last 13 years to 2007. 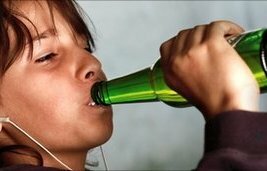 Adolescents in the UK are now amongst the heaviest drinkers in Europe. In the meantime, I believe there is still a good case for IBA with younger adolescents as long as safeguarding and other risks are covered (see NICE PH24 recommendation 6). If IBA opportunities present, practitioners should be able to use a combination of common sense and good IBA skills. For instance it’s broadly accepted that children and young people are more likely to be motivated around risks to their personal safety, injuries, appearance or other more immediate harms. So highlighting things like risks to high blood pressure probably aren’t going to be the most effective approaches for framing IBA for younger groups. Nonetheless, we shouldn’t overlook that we have been seeing a trend in younger and younger adults presenting with liver disease. One of the key things SIPS Junior will reveal will be which screening (identification) tools may be best suited for younger adolescents. For children aged 10-15 in contact with professionals, NICE suggests consent and use of the Common Assessment Framework (CAF) to obtain a detailed history of their alcohol use, including background factors such as family problems or other issues. A comprehensive list of further guidance, resources and reports relating to children and young people is available here from the Alcohol Learning Centre. How to decide what to do, whatever the evidence. At the recent Cyrenian’s conference on the potential for delivery of alcohol brief interventions in untested or unproven community settings, Dr. Andrew Tannahill’s presentation with the above title, may be of interest. Rather than an ‘evidence rules’ approach decision-making, his thesis (part of his work for NHS Health Scotland) advocates 10 principles to underpin an ethics-based approach to deciding how to improve population health and reduce health inequalities. The alternative motto of this approach, he claims is ‘ethics rule: evidence serves’. Dr. Tannahill’s presentation goes through each of the principles and considers how it might be applied to the rollout of IBA in new or untested settings and is well worth a look. You can also read his journal paper on the framework. Personally, I find it offers an answer to concerns I have had about how to balance the need for evidence with the great need to do something effective about alcohol consumption. A solely evidence based approach is not always possible – many, many aspects of what we do are not evidence-based, and it seems to me unlikely that we will ever have really robust, hard evidence for many ‘interventions’ by many practitioners. Dr. Tannahil’s approach offers part of the answer. A shorter answer may be that – if we choose to do new things – we have a responsibility to contribute to knowledge about them – by clearly describing why and how and what happened – and to be honest with ourselves and others about exactly what the level of evidence is.